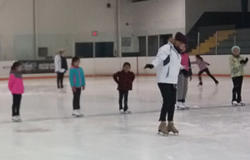 During the Learn to Skate programs skaters will learn the basics of skating from the beginning. By the end of a season skaters are expected to be able to skate on their own for recreational skating. Each season skaters can expect to complete one level or have improved eight skating skills. By the completion of the Learn to Skate program skaters are expected to be able to skate competently on their own and will have learned all of the basic skating skills that they need including forward gliding, backwards gliding, stopping, turning and being able to fall and get up on their own. The Learn to Skate program will be taught in groups with about a 1:8 coach to skater ratio. Skaters are initially placed into classes based on their age and skating level. Upon initial assessment coaches may place skaters into a more appropriate class based on those criteria. During these Learn to Skate classes coaches will demonstrate each skating skill, each skill will then be practiced together as a group. Coaches will then watch the group perform the skills taught and make informal assessments to see where improvements can be made. This Learn to Skate program is open to any skaters between the ages of 3 and 12 that have never skated before or that can skate on their own and want to improve their skating skills. Skaters are required to have properly fitting skates and a CSA approved helmet. Coaches will assess skaters formally at least three times during a season. There will be an initial assessment to see what skating skills a skaters has at the beginning of the program. Coaches will then have a mid season assessment to see if skaters are improving their skills and to see what areas skaters would need improvement in. There is then a final season assessment where coaches make a final assessment of what skills have been learned. When a skater is able to perform an element consistently the coach can report this be check marking the element on the skaters skating progress sheet. Parents are able to login to the website to view their child's progress online. Canlan Ice Sports Rink 3552 Victoria Park Ave.
Our Learn to Skate for Tots ages 3 to 5 is a 10 sessions long program and 30 minutes a session. During this program coaches give lessons at Learn to Skate Levels 1, 2 and 3. This gets tots comfortable with being on the ice and gives them some basic skating skills. This Learn to Skate program is 10 sessions long and 50 minutes a session. It is designed for skaters that are learning to skate from a beginner to more advanced levels. Skaters will be placed into the appropriate course according to their age, skill level and any Learn to Skate badges earned. Any CanSkate or city program levels will be honored. *** If you are already a Skate Toronto member then please login to register for your program. If you are not a Skate Toronto member then please use this registration page to register for a program and to register for a Skate Toronto membership.